This Joe & Seph's Salted Caramel Popcorn in grabbable 35g foil pouches is a brilliant alternative to run-of-the-mill snacks. This gourmet, deliciously flavoured popcorn is ideal for peckish hotel guests, whether they just need something to stave off hunger pangs or they want a snack to accompany an in-room movie. The ideal size for delivering to guests as part of your hotel turndown service, for including with guest welcome packs, or for selling in the hotel shop. This mouthwatering popcorn has a sensational sweet and salty flavour. Buttery caramel combined with sea salt - delicious. Joe & Seph's popcorn is handmade in England and air popped. All the ingredients are natural, vegetarian and gluten free. They even have clever flavour sequencing so the flavours release as you crunch. Shelf Life: Approximately 5-6 months from date of manufacture. 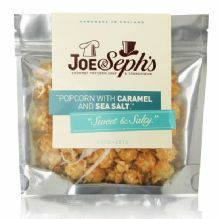 Joe & Seph's Salted Caramel Popcorn is also available in 7g mini packs, 17g transparent packs and 18g Fair Trade packs. If you're interested in larger sizes or alternative flavours, just get in touch about a arranging a special order. We can even supply co-branded popcorn! ​​​​​​​Due to the nature of this product, it is unfortunately not covered by our usual returns polilcy. Please contact us for more information if required.